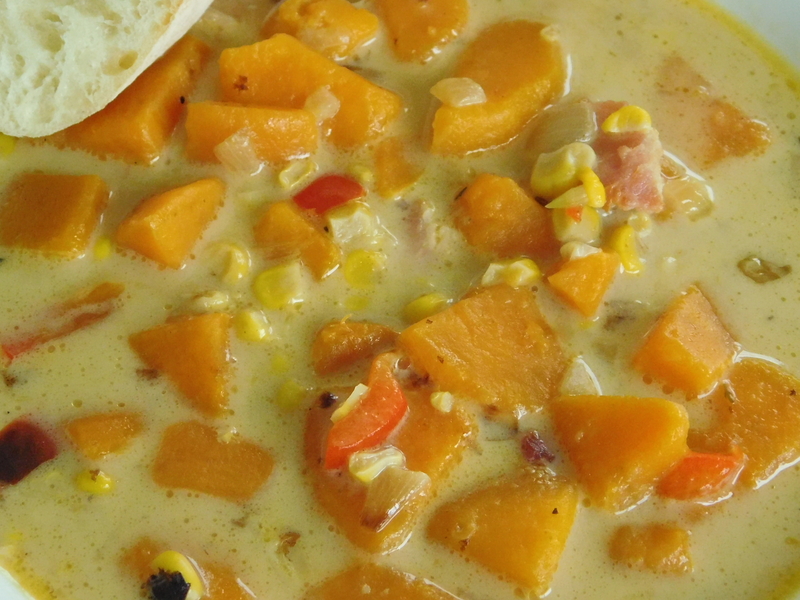 The recipe for Sweet Potato Corn Chowder is one that I’ve been making for years. I can see on the bottom of the page (ripped from a magazine) that it was in the Country Cooking 1994 edition. 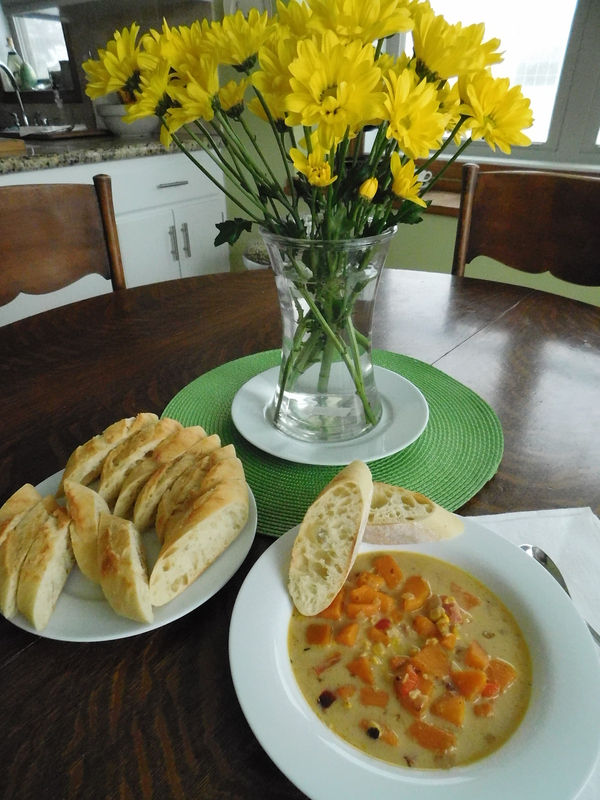 There’s nothing better to make on a cold winter’s (um, I mean April) day than soup. Yes, I mean a cold April day. I made this soup on Saturday, when we were blessed with a rare spring blizzard here in Minnesota, dropping 16″ of lovely new snow on us. Ugh. I just want to sit on the deck, not shovel it!!! Oh well, warmer days are on the way and the snow won’t last long. I hope. Remove bacon with a slotted spoon and set aside. Saute, stirring occasionally, 10 minutes. 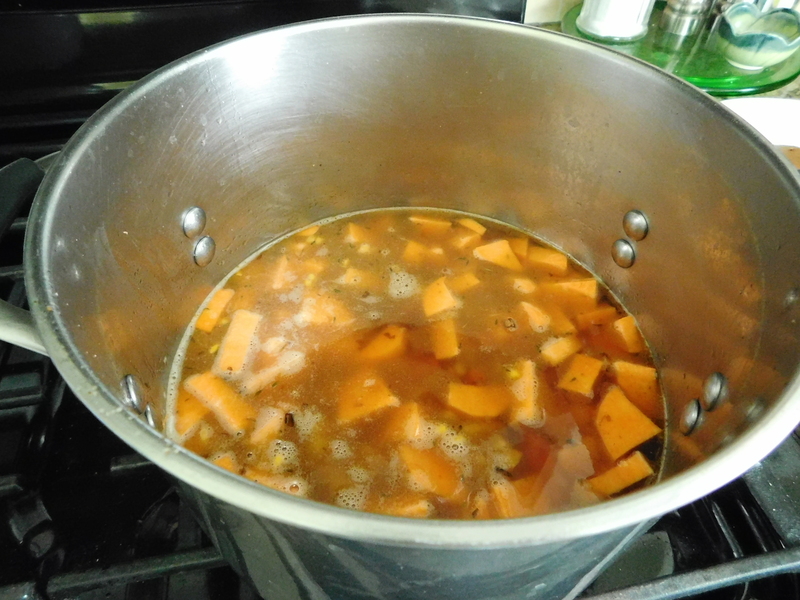 Cook until sweet potatoes are tender, about 15-20 minutes. 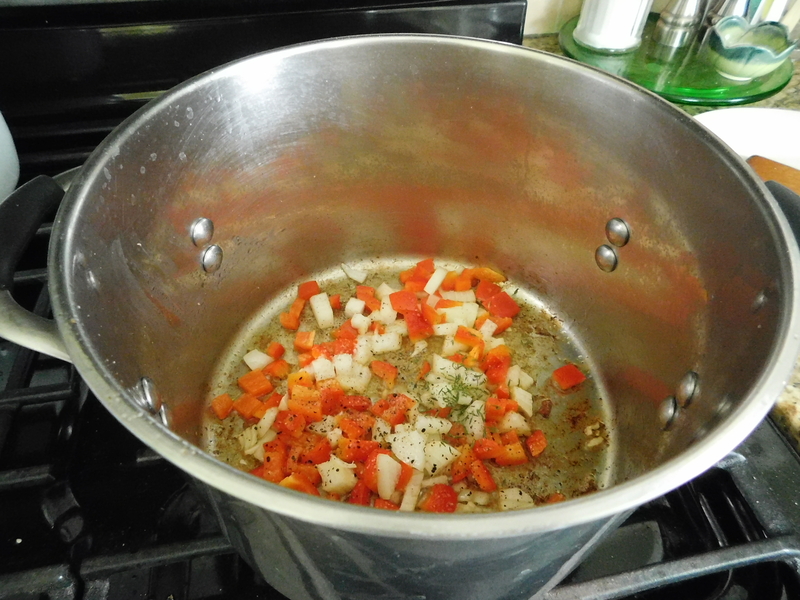 Heat soup to boiling, stirring constantly, and cook until thickened. Heat just until bubbles appear at the sides of the pan. Garnish with fresh thyme sprigs, if desired. After frying the bacon, remove it but leave the fat in the saucepan. In go the first round of vegetables. Here is round two – everything but the cream and bacon. 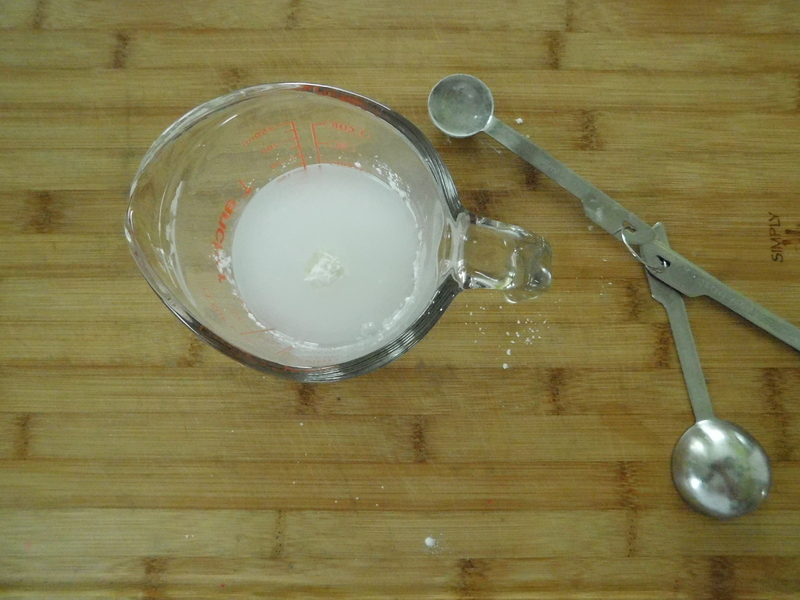 I saw somewhere, years ago, that the best way to mix cornstarch and water is to do it with your finger so you can feel that it is, indeed, mixed. Here we are after the cream and bacon has been added. Serve this with a loaf of crusty bread, and maybe a salad, and you have a delicious lunch or light dinner. My family loves this warm and comforting soup. If there are any more snow days, make this for your family and see if it doesn’t make having to wait just a bit longer for warmer weather more tolerable. 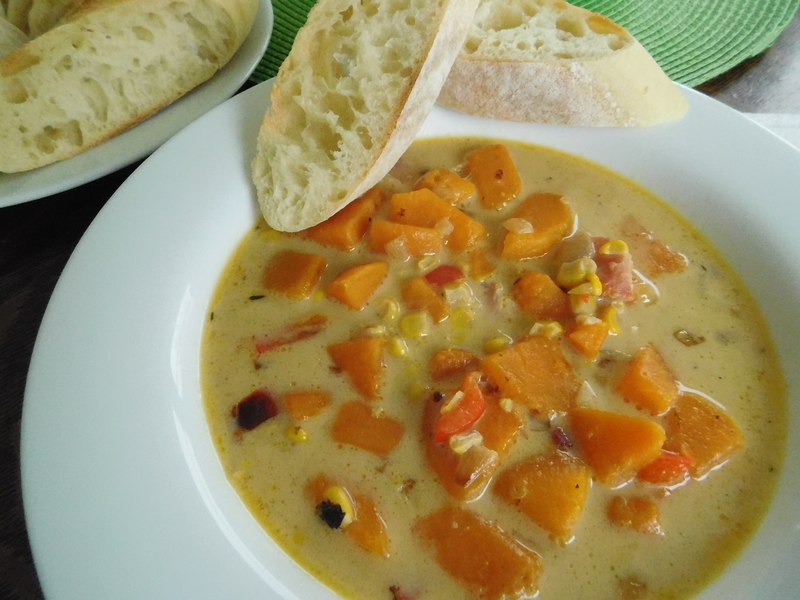 They’re going to love this Sweet Potato Corn Chowder as much as we do! This looks wonderful! Will definitely have to give it a try.